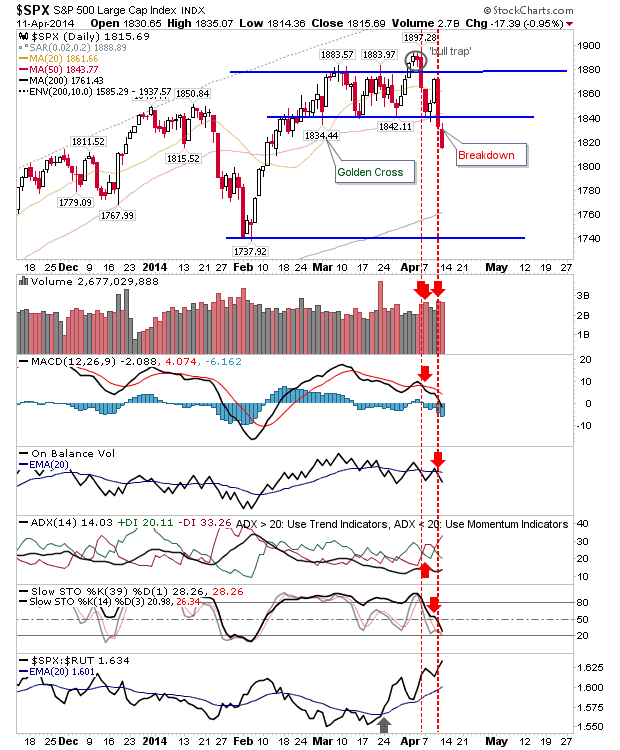 Thursday's sell off got some continuation on Friday, but volume dropped as the number of bailing sellers dropped. All indices now sit inside No-Man's Land of between 50-day and 200-day MAs - where it becomes harder for either side to gain an advantage. The Russell 2000 will be the first index to test veracity of demand at the 200-day MA as it sits just a few points above this important support level. For the Russell 2000, a push below the 200-day MA would quickly set up for a test of the February swing low. My expectation is for a trading-range style bounce from the February swing low, with the 200-day MA only to provide a brief respite from the selling. 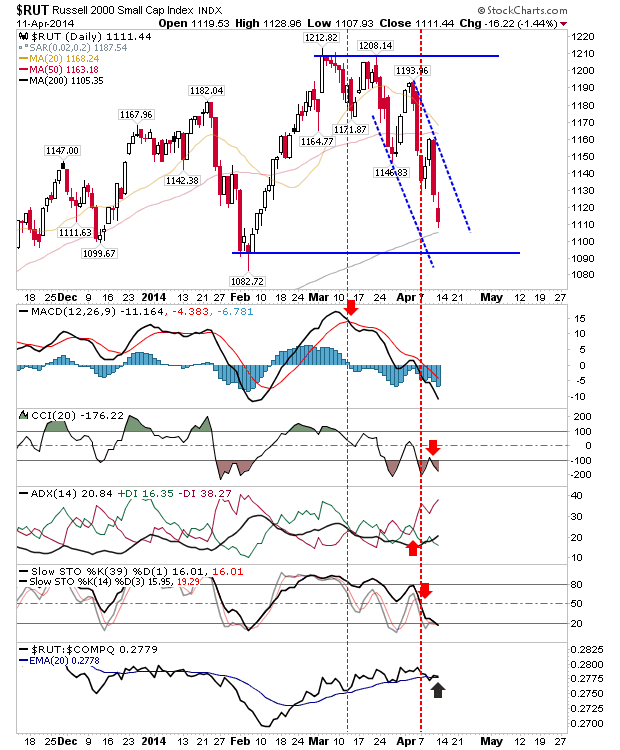 Technicals are oversold, which will help bulls, and the Russell 2000 is attempting a stronger recovery relative to the Nasdaq (but not yet to the S&P), which suggests money is prepared to come in at these levels. The Nasdaq is interesting for another reason. It trades well above its 200-day MA, but finished Friday flush on support of the December-February swing lows. If this swing low is to offer support, Monday will have to see a close above this line (although an intraday violation is okay). A morning sell off, followed by a recovery after the first hour, might be a good value long trade for this bounce. Grabbing some after the first hour of trading could offer a relatively low risk upside opportunity (stops on loss of 200-day MA). 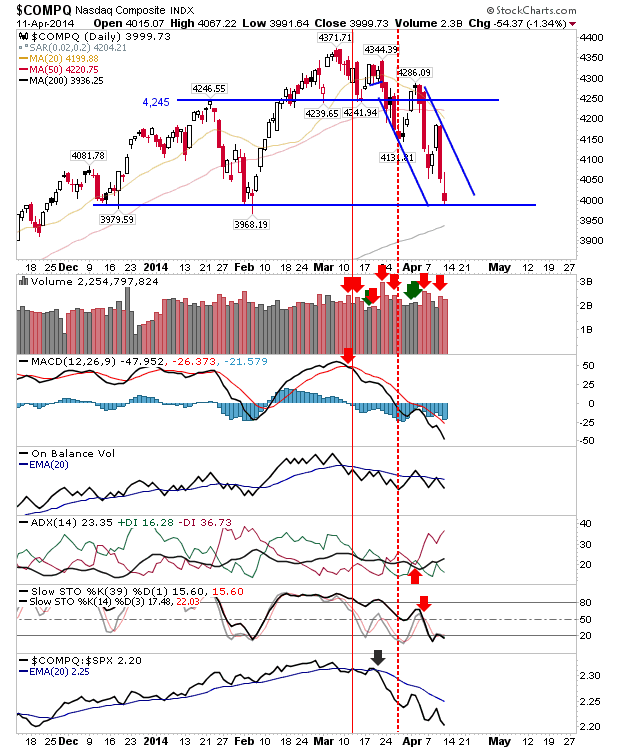 If a bounce was to emerge from these levels, then I would be looking for a bearish head-and-shoulder pattern, with the rally taking the index back to 4,245 before shorts make their next attack. 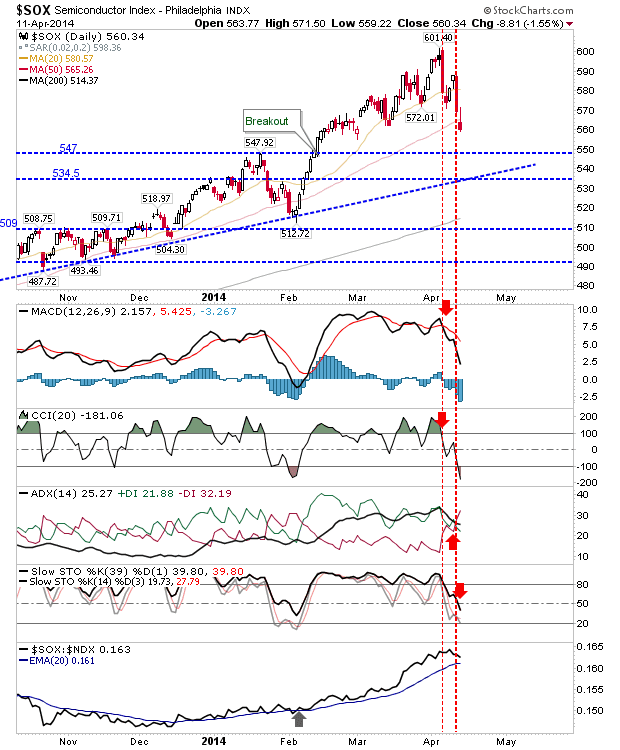 The Semiconductor Index finally turned net bearish technically after Friday's close. It undercut its 50-day MA, but remains a long way above it's last significant breakout level (trend support, or indeed 200-day MA). Despite the sell off, the semiconductor index is not yet oversold, but given prior bullish strength I would expect a good bounce here (back to highs - but may struggle to new highs if lead indices are troubled). Watch for a 'bear trap' from the 50-day MA; i.e. a rally which closes above the 50-day MA. This might be an interesting long play with a stop below the low of that day, or 559, whichever is lower. Bears do have another trick up their sleeves. 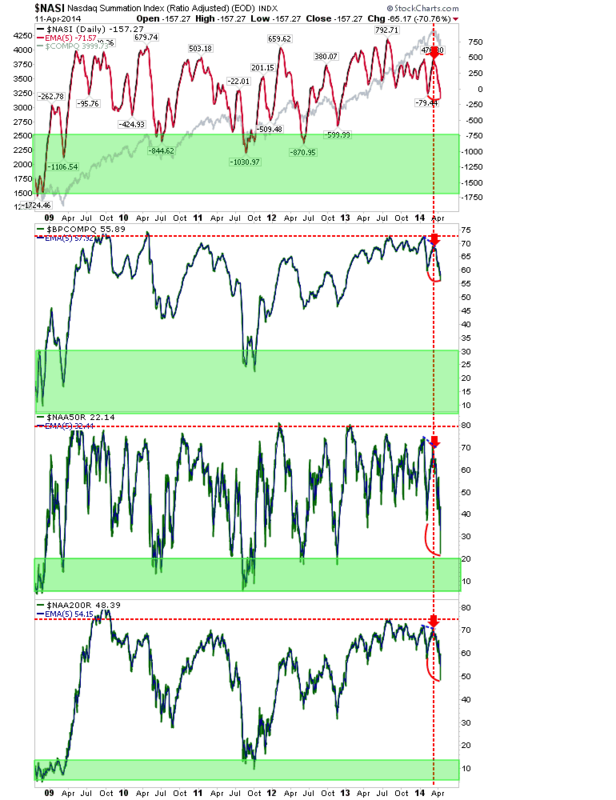 This sell off has killed the bullish breadth in the market. 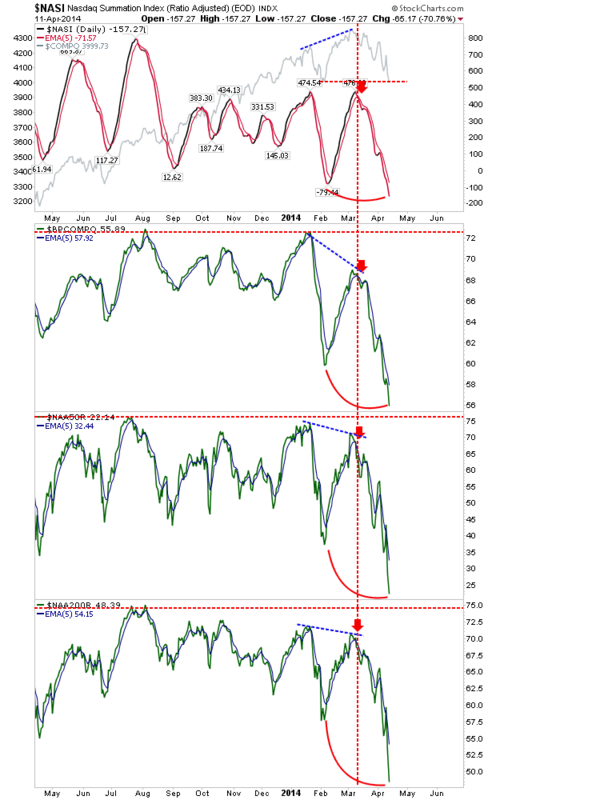 All key breadth metrics have sliced below their prior swing lows, and dropping into territory more suited to cyclical bear markets than bull markets. The Nasdaq Summation Index is negative (cyclical bear swing lows can come in below -1,000, but most frequently in the -600 to -800 range). The Bullish Percents cling to net bullish territory, but only 22% of Nasdaq stocks are above their 50-day MA, and 48% above their 200-day MA. Losses in the percentage of Nasdaq stocks above their 200-day MA has the look of a blowoff selloff, which should see a strong swing low soon, one comparable to the low created in 2012 which led to the current rally. Finally, the S&P put a little distance from the February-April trading range, enough to make a 'bear trap' unlikely. Hard to say if there is an edge for either bulls or bears. Technicals are not oversold, but a spike low would probably be enough (a morning sell off followed by an afternoon rally). Monday may present an opportunity, aggressive long could look to fish for buys in morning trading. Monday might be a day to look for longside opportunities. 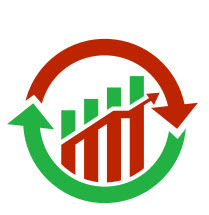 After the first hour of trading will likely offer the best value, but more cautious traders may wish to wait for a intraday breakout before committing.